My card today is for three challenges. 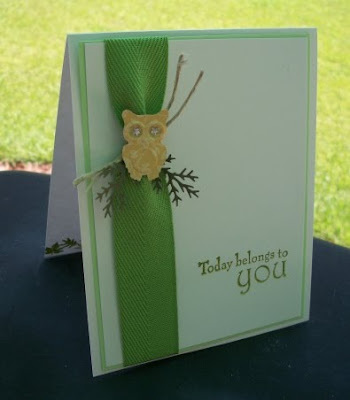 For Sharon's Challenge, I made this cute owl card for my brother's birthday coming up soon. This one is to make a guy's card. It also fits a sketch challenge at Stamping 411. And The Shabby Tea Room #27 Challenge is to use green inspired by a lovely plant photo. I changed the layout to the side and placed the sentiment at the bottom. The inside was stamped with "have a HOOT on your birthday" and a row of leaves at the bottom. What do you think? oh how clever to reuse your the ribbon from the towels. Beautiful job! Very pretty!!! Love how you turned the sketch and that owl is too stinkin' cute!! Thanks for playing along with us this week over at the Stamping 411 Blog!! So cute! Love how the owl sits atop the ribbon! Very cute card - love the CAS look! Love how you flipped the sketch, and that owl is just too cute! Love it! Such a clean and simple, eye-catching design. Love the green ribbon with the owl tied on. Fabulous. Thanks for sharing with us at TSTR. Love how you tied the owl on the ribbon! Clever! What a sweet little owl! I love the little branches behind him! Love that you re-purposed the ribbon! Beautiful card Robbie! I think this is DARLING! Ok, not darling.... it is going to your brother.... not a word he would use probably. But It really is... love the white space and the owl cinched up on the ribbon with the touch of greenery. Cute as can be!